With the addition of a colonist bar to Alpha 14, it feels like a good time to be retiring my interface mods. It's been immensely satisfying working on these mods and seeing aspects of them make it into the vanilla game, but it's difficult as a modder to not eventually lose interest and move onto other things. I appreciate all of the kind words and feedback from what really is a great community and look forward to seeing what's next for this great game. The EdB Interface consists of a set individual mods that change the game's user interface, adding new utilities and tweaking the vanilla game to make it easier to interact with. I'm working on it. I've made the decision to split the interface mod into multiple smaller mods. There are a handful of reasons that I'm doing this, and while it makes it a little less convenient for people to download and install, I think it's for the best in the long run. I'm still not sure when I'll be finished, but you can expect releases of various mods as I move forward. Currently, early releases of the Colonist Bar mod and the Inventory mod are available. IMPORTANT: This is a simple version of the colonist bar only. No squad management; none of the other interface tweaks. I would still consider this a "beta" release, but early issues have been resolved. I think it's fairly stable. Just as warning, the mod is a "map component" mod. This means that if save your game with the mod enabled, you will get an error message if you try to load the game without the mod enabled. This error should actually be harmless, but be aware of it before you try adding a mod that potentially still has bugs to a new game. Also, it means that you must start a new game to get the colonist bar. You cannot add it to an existing game without modifying your save file. IMPORTANT: This is the first release of a standalone mod for the Inventory Tab. I expect that this release has a couple of bugs, but if you're interested in testing it out, please do, and let me know if you run into any issues. Version 3.1.2 is the second Alpha 12 release of the mod. Please report any problems that you might run into. I'm sure there are still a few in there. This release fixes a minor bug that was in the previous release, related to the display of the mood indicators in the Needs panel. Click the Squads button along the bottom of the screen to bring up the Squad Management window. Organize your squads here. Browse squads from the Colonist Bar with the new browse buttons that appear when you have more than one squad. Configure keyboard shortcuts for your squads in the vanilla Keyboard Configuration dialog. Use the shortcut to quickly select squads. Shift- or control press the key to assign a squad to the configured shortcut. Press the key once to display the squad in the colonist bar. Press the key twice to select all colonists in the squad. Added a squad filter to the Work, Outfits and Restrictions windows. 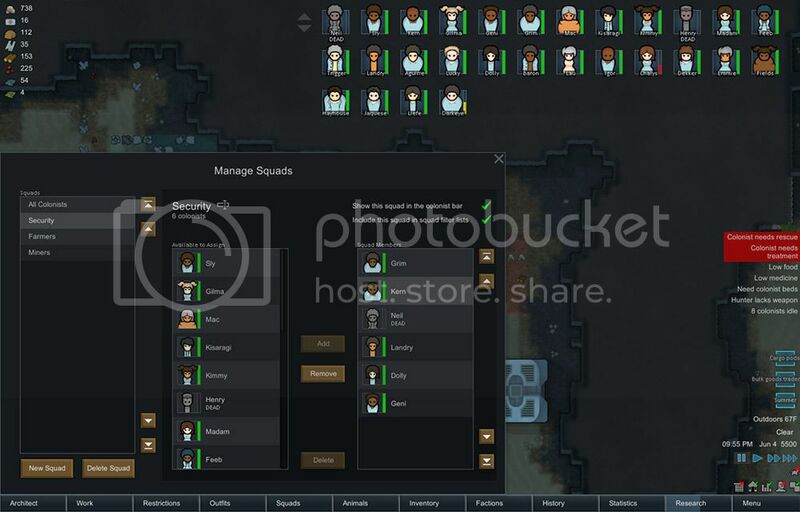 Choose a squad and only those colonists will be displayed in the list. Added a row to the top of the Work, Outfits and Restrictions windows. Select an option in this row to assign it to all of the colonists in the list. Added an option to display the current time using a more recognizable "hours:minutes" format instead of the vanilla "10h" format. Not enabled by default. Added options to hide any button along the bottom of the screen that you don't use very often. This can be especially useful for users with smaller screen resolutions. Downloading from Nexus Mods should not require that you create an account over there, but if you'd prefer an alternate place from which to download, you can log in to the Ludeon Forums and download the mod from the attachment at the bottom of this post or use the Dropbox link below. The latest version of the mod works with the Alpha 12d release of the game. It will not work with earlier Alpha 12 releases. Adds the Colonist Bar along the top of the gameplay window, giving you another way to select colonists and to quickly see their status. Organize your colonists into squads using the Squads window and display them by squad in the colonist bar. Assign keyboard shortcuts to quickly display and select your squads. Adds an Inventory window, showing counts of all of your colony's resources, apparel, weapons, buildings, etc. Changes the layout of several tabs, windows and panels. Look at the Interface Options dialog, which you can get to by clicking on the gameplay Menu. From here you can disable any of the mod's features that you don't like. See the changelog below for a full list of additions and changes. Some features are better suited for larger window sizes, but if you're running in a smaller window, you can shut off the features that do not work as well. 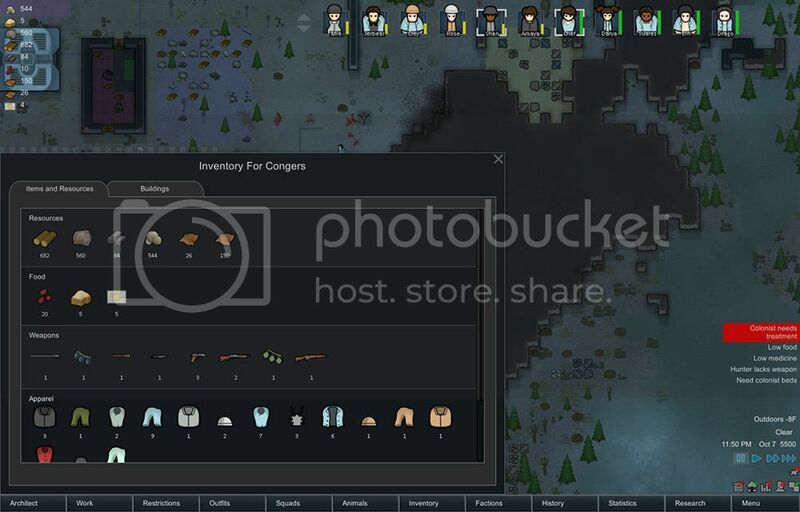 To install, simply extract the contents of the zip file into the RimWorld mods directory. If you have a previous version installed, please remove that version first. The most common problem that people run into is that they double-extract the mod folder from the zip file. If the interface changes are not appearing for you, make sure that you have not ended up with an extra directory inside your mod folder. The mod contents should be in the "Mods/EdBInterface" directory, NOT in a "Mods/EdBInterface/EdBInterface" directory. Need to give proper credit to Joretap0 for his Inventory Panel mod. The implementation here is separate and the features are a little different, but the idea is the same. Thanks to everyone who has provided a translation or provided feedback to improve them (Humort, Kvarfax, F0xGun, Latta, kaptain_kavern and others). Thanks to everyone for the positive feedback and suggestions for new features! - Added support for Alpha 12.
squads. Squads are displayed in the colonist bar. - Assign keyboard shortcuts to each squad in the Keyboard Configuration. to select all of the colonists in the squad. the list to only include those colonists in the squad. displayed with hours and minutes instead of the vanilla "8h" display. Optionally display the time with AM/PM. bar when a colonist's status changes. - The colonist bar now shows when colonists are in cryptosleep. - Added finer grain control over which alternate tabs you want to use. corner of all of the main tab windows. size, but you need to manually enable/disable the various tabs. That adds a great deal of efficiency to the game. It's almost as useful as the Inventory mod. Note for all: in the vanilla game you can hit < and > to cycle colonists (and center the camera on them). I love UI Mods. Ty, you ought to have plans of integrating this into the vanilla game. +1 internetz to you, Mr. EdB. Unfortunately the base game sets the standard minimum res of 1024x768, while this mod requires 900px tall. Otherwise the base game would probably look more like this. Aw, true. Can a scrollbar be put in that thing? Released a new version (1.1.1). It contains a couple of bug fixes, and I changed the hooks that initialize the mod so that it's now more compatible with other mods. It also adjusts the Bills tab to include the repeat options in the tab itself (instead of having to open the "Config" dialog to get to them). BUGFIX: Next and previous buttons in the "Status" tab should no longer appear as green or red buttons. BUGFIX: Selected zones no longer display invalid designation commands. Reworked the Bills tab. The most notable change is the addition of the repeat options to the tab interface. You no longer need to open the config dialog to get to these options. The Colonist button does a better job of trying to restore the tab that was open the last time that you used it. Changed the mod initialization so that it no longer relies on definitions in the Races_Humanoid.xml file. Changed the mod controller so that it no longer gets called every frame. Resized the Bills, Growing and Storage tabs to match the width of the colonist tabs (for consistency). Made the Designation info box a little taller to better fit building names from translations and mods. Released a new version for Alpha 6. Also contains a bug fix to stop the initialization definition from appearing in stockpiles. Split the "Status" tab back out into "Health" and "Thoughts" tabs to match the vanilla game, but moved the Food and Sleep meters from the Health tab into the Thoughts tab. Renamed translation keys to avoid naming conflicts with vanilla or other mods. BUGFIX: The initializer is now defined as a building instead of as a pawn, which fixes a couple of issues. Initializer definition no longer appears in stockpiles under the animal corpses and meat sections. Games saved while the mod was enabled should now load when the mod is disabled without the "Could not load reference to EdBInterface_Meat/Corpse" errors. Saved games from previous versions will need to be saved again to remove these errors. I really enjoy using this, but I'm forced to disable it because of my resolution at 1024x768 . Would it be possible to make a wide variant of the interface, instead of one that's so tall? I wouldn't want to badger if it's too much hassle, but this mod really does make things more pleasant for me, and I'd love to continue using it. Would it be possible to make a wide variant of the interface, instead of one that's so tall? I've released a new version that addresses this issue. For screen resolutions with a height of less than 900 pixels, the mod keeps the tab panels from the vanilla game. 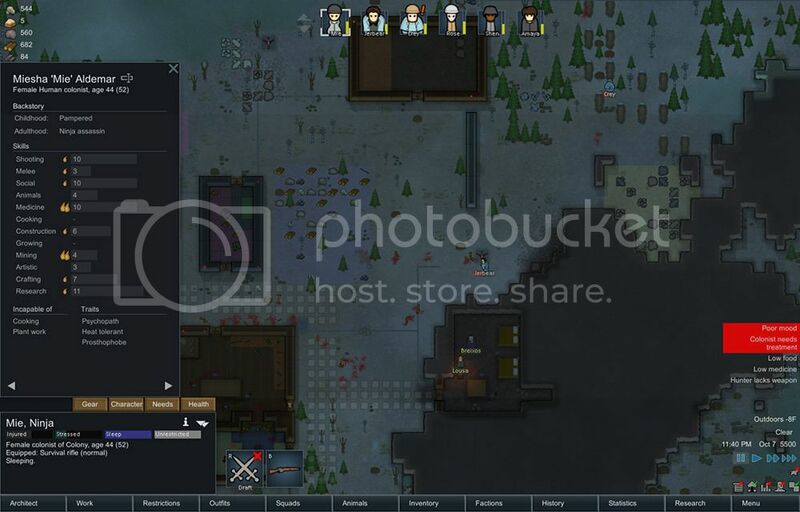 You lose some of the layout tweaks, but you still get the Colonist button, the next and previous arrow buttons and the changes to the Bills tab. Added support for windows smaller than 900 pixels high. Uses the tab panels from the vanilla game in these cases, with the next and previous colonist arrow buttons added to them. The mod decides which tab panels to use when it switches into gameplay mode from the main menu. If you change your resolution in the middle of a game, the tab panels will not change. Save your game, go to the main menu and reload it to get the panels to switch.